← Get Your Bard On With Free Shakespeare In The Park! There are hundreds of places in the city to catch an awesome Chicago-style hotdog – from the self-proclaimed “encased meats emporium” Hot Dougs to the sometimes lewd and usually crude Wiener Circle. So just where does a local family go to enjoy a good hot dog? Our hot dog provider of choice is Superdawg. This charming drive-in is our go-to spot for celebrating birthdays, good report cards, and fine summer nights. Located on the far northwest side at 6363 N. Milwaukee Avenue, this hot dog hot drive-in is well off the beaten tourist path. 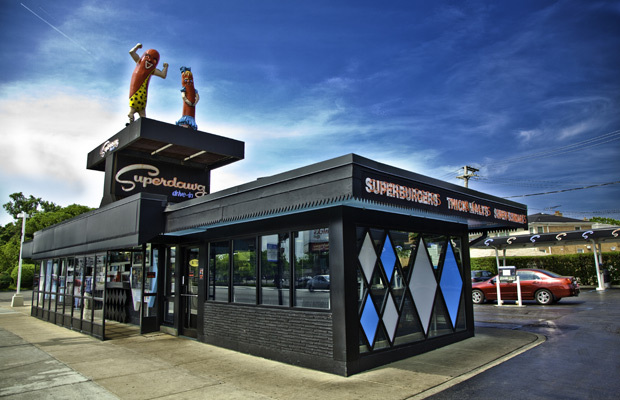 But if you’re in town and you’ve got a car, Superdawg is a must-do (and eat!). You’ll know you’ve arrived when you spot the unique hot dog mascots, Maurie and Flaurie, on the rooftop. Opened in 1948 by two young newlyweds, a G.I. and his school teacher sweetheart, Superdawg has been around for generations. My parents used to go here on dates. And not much has changed: Park your car at one of the carports, state your order in one of the retro speaker boxes, and in a jiffy, your carhop will pop out with your order. When you’re finished, just flip the special switch and a carhop will return to clear away your trays. (Here’s a neat video of Superdawg in the 1950’s.) My kids find the entire process entirely amazing. The hot dogs are simply delicious. Order the fully loaded Chicago-style dog – which will come served with all the local trimmings: mustard, piccalilli, chopped onion, and a hot pepper. When in Chicago, do as the Chicagoans do (or don’t in this case) and FORGET THE KETCHUP. Save room for some of the best crinkle cut fries ever. And since you only live once, order a Supermalt or Supershake. This entry was posted in Dining, Family and tagged best hot dog in chicago, best hot dogs in chicago, chicago hot dog. Bookmark the permalink.